Dr. Mike O'Donoghue was the Companion Magazine featured member for Summer 2018 - Read the full article in Companion Magazine. Growing up in Brisbane, I always knew I wanted to have a pet dog. For a variety of reasons, my family wasn’t destined to get one, so I had to wait until I turned 18, when my parents surprised me with a golden-Labrador-cross that they rescued from the pound. Dusty seemed to channel his inner-Houdini, and often disappeared for a short time, only to be found patiently waiting, whether it be by the river or the train, for someone to return him home to his family. Unfortunately, Dusty passed away after eating a toxic substance one night. Having seen and experienced the human-animal bond firsthand, my interest in that bond was piqued. In 1992, I graduated with his Bachelor’s in Veterinary Science from the University of Queensland, before embarking on my career; through his varied experiences and practices, I was still thinking about the human-animal bond. One experience I had was that a man came in to have his dog euthanased and it seemed as though he didn't care about the dog. He merely seemed emotionally blank or casual about dropping his dog off for euthanasia and I felt that he didn't care and that he was pretty blase about losing his dog. After he left, I was talking to the nurses saying that the guy seemed pretty heartless, he didn't really seem to care about his dog and it was a lovely dog. Then we looked out the window and there he was in the car park, hunched over the bonnet of his car, balling his eyes out. I thought, "Oh my goodness! I really misread that." So often we don't really know what's going on in people's minds. This was a pivotal moment for me in the way that I treated my patients’ owners in my practice, and it serves as a regular reminder still. Oftentimes people can appear “hardened” or “unaffected” by grief, to those around them, particularly if they do not have the outward emotional response that we expect from them. In this case, I projected my own sense of “normal” emotional response onto this man, which, I quickly realised, was completely unfair of me. As my younger, less-experienced self, I passed judgement on him and assumed he didn’t care enough about losing his dog, when in reality, he clearly did care. The lesson I learned that day was that, as vets, we should be careful not to make assumptions about our customers and how they feel about their animal companions, based on fleeting moments, especially difficult ones - like taking their pet to be euthanased - at that. When I saw this man crying in his car, I realised that not everybody grieves the same, and we do not always know the whole story. This story reminds me that it isn’t just the pets we see that need to be treated with compassion, but the people too. As vets, we are on the frontline when it comes to helping people through their grief. We are the face they associate with their pets’ loss, and we are the person they connect with during and immediately following. If we aren’t showing them compassion and understanding, regardless of their outward reaction, who else will? We are in a unique position because we deal with pet loss regularly. While these moments can be uncomfortable, I do urge all vets to have pet loss resources in their office in order to support the families through such an emotional and difficult time. Treat everybody with kindness and compassion, and let them know that it is okay to express their grief. Oftentimes, once a family has recovered from their grief, they will get a new family pet, and will want to return to a vet that has treated them and their pet well, and has demonstrated expertise, compassion, and kindness. 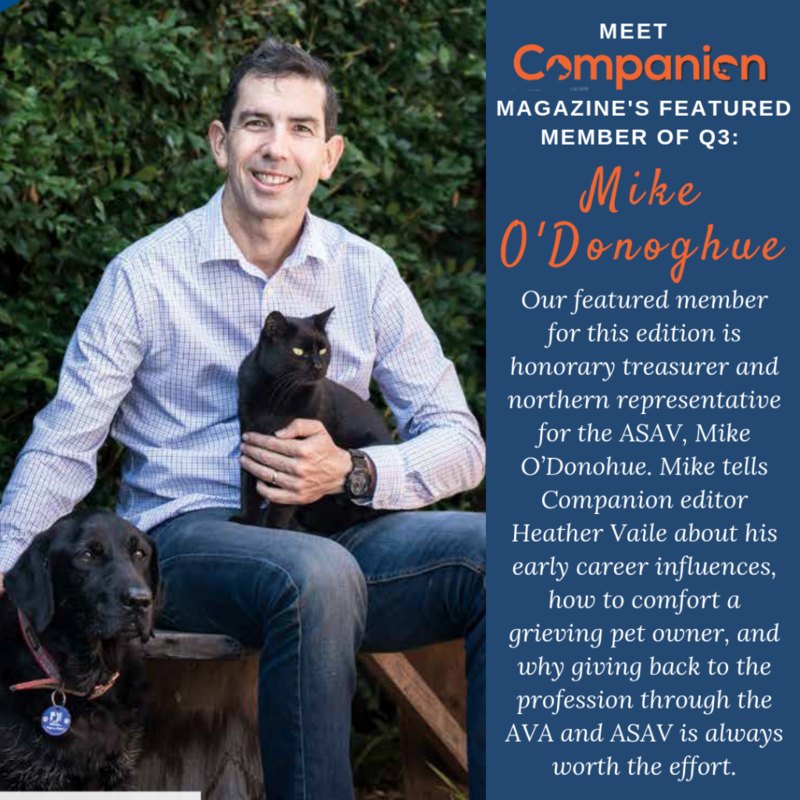 With many contributions to the veterinarian field, Dr. O'Donoghue was honoured to be recognised by AVA as a featured member and to sit down with Companion Magazine to discuss the influences in his life that ignited his passion for pets and people. >> Read more about How to Support Your Clients Through Pet Loss and Grief. >> Read more about Supporting Children with Pet Loss.